Ferguson has been on the mind of just about everyone in Missouri…and in a few other places, too. Jay Nixon has declared a State of Emergency, if you haven’t noticed, in anticipation of an innocent verdict. He’s also sending National Guard elements to St. Louis and Kansas City. Outside agitators say they’ll riot if Ferguson Police Officer Darren Wilson isn’t indicted for ‘something’. Ferguson and St Louis residents are preparing, too. Gun sales have gone through the roof. Evidence that has been leaked by insiders to the Grand Jury, clearly supports Wilson’s version of the event and exposes the lies of some of the witnesses. Evidence, or innocence, isn’t the issue for some. Wilson is guilty, if nothing else, of being a white police officer in an area where the majority of the citizens aren’t. Those agitators don’t care whether Wilson is innocent or guilty. The situation provides an opportunity for them to create unrest to pursue their agenda. Mrs. Crucis was watching the news most of yesterday. She teaches in a local seminary in Kansas City. Most of her students are black. She isn’t concern about them, but for them. Her students won’t be the ones out on the street. They have families, jobs, and are too busy to be protesting on the streets. No, her concern is that they will have to travel the streets of Kansas City, endangering themselves, if Wilson is found innocent and lawless protests break out in Kansas City. Jay Nixon has won no laurels with his proclamation of a State of Emergency. Some political activists claim that Nixon’s proclamation was illegal, that such proclamations can only be declared after the fact, not before. 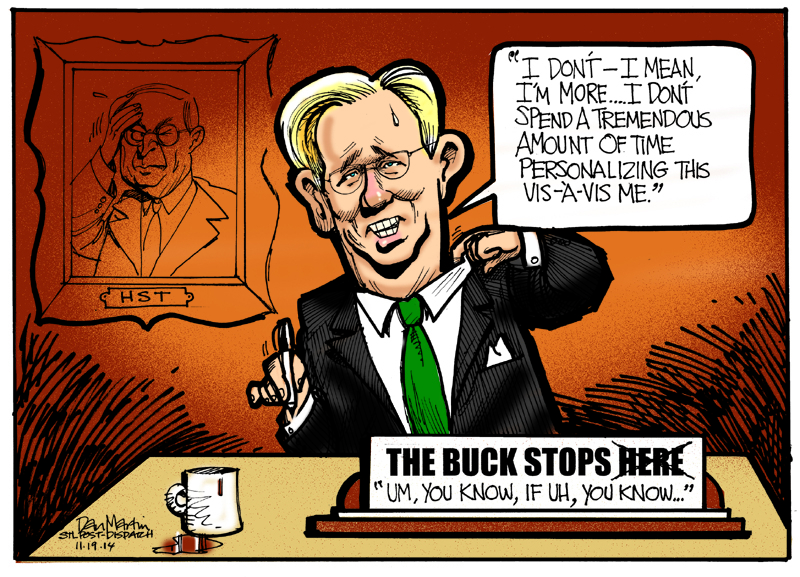 The St. Louis Post-Dispatch, who has never met a democrat they didn’t like and support, published this cartoon about democrat Governor Jay Nixon. It speaks for itself. From the St. Louis Post-Dispatch. So we’re all patiently, well some not so patiently, waiting for news from the Grand Jury. Will the jury accept the evidence that Wilson was doing his duty and defending himself, or will they throw a scapegoat to the mob? Today’s post title is taken from a play by nihilist, Samuel Beckett. In his play, two characters, Vladimir and Estragon, wait endlessly and in vain for the arrival of someone named Godot. Today and until the Grand Jury in St. Louis speaks, we are all like Vladimir and Estragon, endlessly waiting, not for the arrival of Godot but for the Ferguson grand jury to speak. This entry was posted in Anarchy, Attacks by Leftists, Barbarians at the gates, Lynch Mob, National Guard by Crucis. Bookmark the permalink.